It’s more comfortable to wear than the initial prototype. Only downside: there is a spot where my nose supports some of the weight of the Rift and that spot is not covered with foam, so that hurts a bit after a while (but that can be easily fixed by gluing in some foam). The changeable lenses are great, I’m near sighted and cup C works best without glasses for me. Sadly this means that I see a smaller part of the screen. The head tracking works great! For example: when you adjust the placement of the Rift on your nose, the rendered image stays static and you get the impression that the Rift is just a pair of binoculars that point to a large but static screen. The resolution is too low: you can see pixels, the black gaps between them and also the RGB subpixels. After 90 minutes of playing Half-Life 2 I got a bit motion sick while I had no problems with the other demos I tried. Framerate matters a lot: The demos that run very smooth on a desktop PC that only make 30-40 FPS on a notebook feel very laggy inside of the Rift. 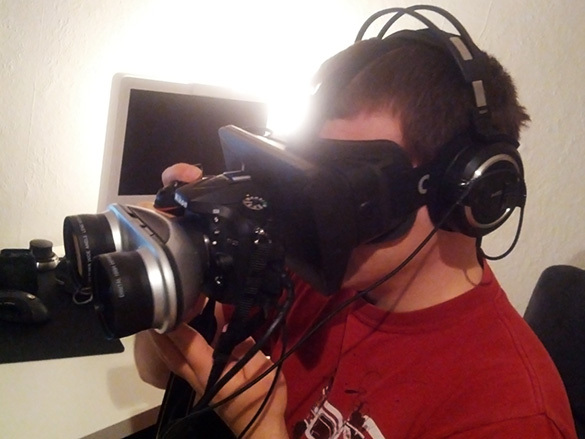 The demand for low-latency rendering and update-loops is higher when using HMDs! Oculus Rift SDK Tuscany demo: It’s part of the SDK so you might have it already (given that you are a developer). RiftRacer: A racing game with currently 3 test tracks. The nice thing about racing games is, that you expect to sit and control your vehicle somehow artificially with your hands. If a first person shooter gives you motion sickness, try a racing game (or similar like a flight simulator etc.). Blue Marble: Listen to your music and float around in space. No interactions needed, just drift away and look around – probably the least problematic demo if you have motion sickness problems. Half-Life 2: Set the launch option to ‘-vr’ in steam and activate the opt-in to the beta program and see how a big game looks in VR. The HUD is not working very well yet, but the game itself is already looking good. The first three demos work on MacOS X and Windows. Update 5/27/13: Regarding HL2, one problem with the HUD is the low contrast on the health display, you basically need to look into a dark area to read it. The second problem is that the weapon switch menu is out of my FoV, but Tom Forsyth gave the hint, that this can be adjusted by setting vr_hud_max_fov to 50 or 40.